Copenhagenize.com - Bicycle Urbanism by Design: Cologne/Köln Ridicules Pedestrians in name of "safety"
Cologne/Köln Ridicules Pedestrians in name of "safety"
Thanks to reader Felix Feldhofer for the photo and the heads up about this story. By and large, history is repeating itself as we work towards making cities better. We are returning to many of the ideas that made cities human - before the automobile appeared. It's often a very good thing. Which makes what is happening in Cologne, Germany, even more comical, bizarre and stupid. It is absolutely shocking. A stunning example of Ignoring the Bull. 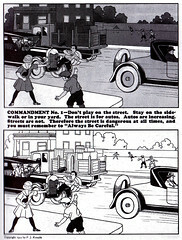 We've written before about The Anti-Automobile Age in the early years of the 20th Century. 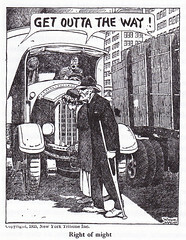 In this article, you can read about the "jaywalking" concept, basically invented by the automobile industry to keep the streets clear for their cars and get the irritating, squishy obstacles out of the way. I highlight this in my Bicycle Urbanism by Design TED x talk. We know it was crazy. We know that it was a desperate - and successful - ploy by the automobile industry to claim the streets for themselves, despite the fact that for 7000 years since cities first where formed, crossing the street was a rather normal thing to do. As Canadian writer Chris Turner points out, there is no jaywalking on sustainable streets. If you thought the idea in some American cities of putting flags at pedestrian crossings for pedestrians to wave at cars when crossing was wacky and sooo last century, you'll love Cologne. The City, the police and the tram company (Big Auto is chuckling in the wings) are financing a campaign to stop people from jaywalking. 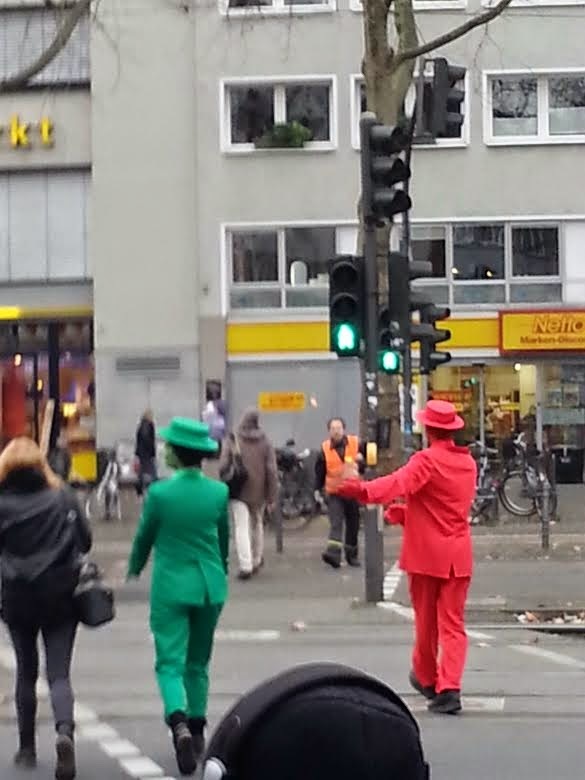 Goofy men in red and green costumes wander around the city ridiculing pedestrians doing what urban homo sapiens have done for seven millenia. Crossing the street to get somewhere they need to go. 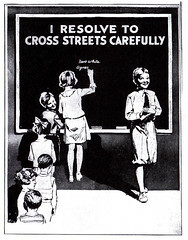 Back in the day, the Automobile Industry enlisted boy scouts to hand out flyers and chastise, publicly, pedestrians who were "jaywalking". Amazingly - and I mean that in the most stunned, jaw-dropping way - the authorities are actually handing out whistles to children when they visit them in schools and training them to blow their whistles at jaywalkers. In the public space. Ridiculing them. It's the Cologne version of a mix between Stasi methods and public stocks - as choreographed by Monty Python. Cologne is regurgitating propaganda from the 1920s invented by the car industry. The police and the city, who are indoctrinating the children between 3rd and 7th grade - for taxpayer money - call it a "behaviour" campaign. They call it "Köln steht bei Rot" - or "Cologne stops for red". 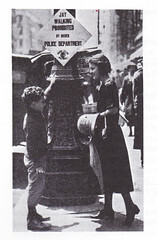 But the whole kid/whistle is an intiative called "Ich verpfeife dich". It's a German play on words. Directly translated it means "I will whistle you" but it also means "I am going to tell on you!" Seriously. That is the level that the City of Cologne and the police are working at. In 2014. It's one thing to get an idea for such a campaign. It's quite another to actually finance it and start it. It is one of the most bizarre examples of cities advertising how completely incompetent they are at controlling the destruction on their streets. Placing the responsibility on the vulnerable traffic users and not the Bull. This entire campaign disgusts me. No offence, American friends, but it something that we're used to seeing coming out the States. That it is happening in a large northern European city that should know better is depressing. It's certainly not a new idea. Bogota has also chased pedestrians in a similar fashion and tried to sugarcoat it in academia. Another article in German about the campaign.